The above quote by Sir Horace Lamb envision the apparent frustration from the “order in chaos” found in turbulence and emanating from the Navier-Stokes equations. Although seemingly a fairly simple set of equations, analytic solutions to even the most simple turbulent flows is out of reach, and one must suffice in obtaining a solution for the flow variables only by numerical confrontation with the equations. The computational effort in Direct Numerical Simulation (DNS) of the Navier-Stokes equations rises as Re in the power of 9/4 rendering DNS so unacceptable and it shall probably remain so for the foreseen future for most engineering applications, its use confined to simple geometries and low Reynolds numbers in the aim of supplying significant insight into turbulence physics that can not be attained in the laboratory. Most of the nowadays CFD simulations are conducted with the Reynolds Averaging approach. Reynolds Averaged Navier-Stokes (RANS) Simulation is based on the Reynolds decomposition according to which a flow variable is decomposed into mean and fluctuating quantities. When the decomposition is applied to Navier-Stokes equation an extra term known as the Reynolds Stress Tensor arises and a modelling methodology is needed to close the equations. The “closure problem” is apparent as higher and higher moments may be achieved, more unknown terms arise and the number of equations never suffices. This is of course an obvious consequence to the fact that taking these higher moments is simply a mathematical endeavor and has no physical addition whats so ever. As RANS is already a working horse but has shown poor performance due its inherent limitation applied to flows of which strong instabilities and large unsteadiness occurs and it does not seem that a breakthrough in achieving a universal modeling methodology is expected soon (or at all…), researchers have shifted much of the attention and effort to Large Eddy Simulation (LES) and hybrid formulations incorporating RANS and LES in certain ways. The first, simplest and most widespread sub-grid scale model is the Smagorinsky model, an eddy viscosity model relating the sub-grid scale stresses to the local flow mean strain through the Boussinesq hypothesis. As much as the model is straightforward it has some inherent deficiencies. 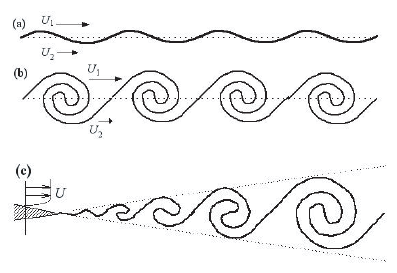 Among is the fact that the Smagorinsky constant is always positive and uniform and as a direct consequence so is the eddy viscosity, which is especially problematic for sheared laminar flows, rendering it as inherently unfit for the prediction of laminar to turbulent flow transition. Another somewhat related deficiency is found in the effect of wall proximity and the value of the eddy viscosity in the near wall region, as the model requires the aid of ad-hoc damping functions and by such the eddy viscosity behavior which should be of the order of the third power of the wall normal proximity is far from attained. The Wall-Adapting Local Eddy-vicosity (WALE) model, devised by F. Nicoud and F. Ducros is based on the observations of the physical turbulence structures nature and is tuned to alleviate some of the Smagorinsky model deficiencies such as wall proximity behavior of the eddy-viscosity and the laminar to turbulence transition. Moreover its local nature allows it to be easily implemented on any kind of computational grid whether structured or unstructured. An observation concerning the contribution of turbulence structures to the global dissipation led to a relation between the eddy viscosity and both the strain rate and the rotation (both related to the velocity gradient tensor), as opposed to the Smagorinsky relation which is between the eddy viscosity and the strain rate only. By tuning this dependence on strain rate and rotation according to expected turbulence physics, the Smagorinsky model specified in the above deficiencies are alleviated, the correct behavior of the eddy viscosity is attained and almost no eddy-viscosity contribution is achieved for wall bounded laminar flows (such as Poiseuille). The approach for devising the model makes it much more attractive to implement than dynamic LES (Germano) which requires additional care to be taken to the requirement of filtering at various scales. Moreover, and perhaps more important, most dynamic LES formulation involve non-local terms, a fact that renders them impractical for industrial CFD solvers. Locality is a very important feature for modern industrial application oriented CFD codes as they do not provide the infrastructure of computing parameters such as integral boundary layer parameters, or allow integration of quantities along the direction of streamlines. Moreover, as industrial CFD simulations often require to be carried out on parallel computer invoking domain decomposition methodologies, flow features such as boundary layers may be split and computed on separate processors such that search or integration algorithms. DES original formulation (termed DES97) could be mapped to a Smagorinsky model form in LES mode. As mentioned in the former paragraphs the Smagorinsky model has some shortcomings, one of which is the model’s inherent inability to correctly model laminar to turbulent transition. With reference to DES this shortcoming contributes to the problem of RANS to LES transition (RLT). The main problem lies in the fact that turbulence in the RLT zone is mainly two-dimensional and dominated by the Kelvin Helmholtz instability. A proposition had been made (C. Mockett et al. 2015) to introduce a modification of the grid scale measure Δ based on the vorticity vector and reformulation of Delayed DES (DDES – DES formulation with a DES-limiter “shielding” to avoid switching from RANS to LES mode on ambiguous grid stencil) in WALE form, avoiding the Smagorinsky’s associated shortcomings while still incorporating a local formulation applicable for industrial CFD solvers. Another reason for the choosing of WALE is to keep the non-zonal approach of DDES. Where fd is almost zero inside the boundary-layer and blends rapidly to one at its edge and in shear-layers where we would like L(DDES) to be the same as L(LES). The end result proves especially beneficial to the RLT problem and a significant improvement to the standard DDES in handling RLT. Nice article. I would like to point out that XFlow Lattice Boltzmann CFD (Dassault Systemes) has an implementation of WMLES, which is relatively practical for industrial simulations.